Can Social Entrepreneurship Transform House Sales? Can anything make buyers trust real estate agents? A new startup for the housing industry is hoping its service will do just that. Giveback Homes, which launched in August, is a network of real estate agents, home builders, mortgage brokers and interior designers. Members pay $50 each month to get listed on Giveback Homes’ website and receive marketing support. Individuals then decide how much, and how frequently, they want to donate to a good cause—an amount that is typically cut from commissions they earn by helping to buy or sell a home, for example. All of the donations—$56,000 raised, to date—have been passed on to the nonprofit group Habitat For Humanity to help build 12 homes in Nicaragua and put toward future houses set for Dallas and Los Angeles. 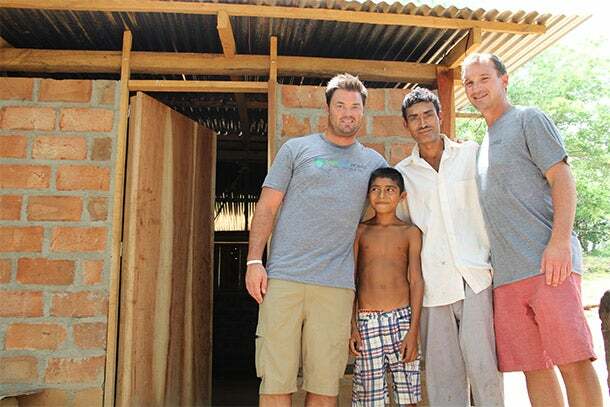 Blake Andrews, founder of Giveback Homes (left) along with real estate agent Nick Schneider (right), whose contributions helped build homes like this one in Nicaragua. Can Giveback Homes help on the reputational front? It couldn’t hurt. In one recent survey, Choice Home Warranty found that more than 67 percent of Americans said they didn’t trust real estate agents. In the land down under, Aussies rank real estate agents 28 out of 30 when it comes to the most ethical and honest professionals—ahead of just ad men and car salesmen, according to Roy Morgan Research. Meanwhile, Giveback is working to stand out itself. Some agents have already printed off between 800 and 2,000 door hangers to advertise their affiliation with the social enterprise, which has led those agents to a handful of clients. Some high-profile clients have also helped boost contributions and visibility for the startup. Richard Jefferson, an NBA player for the Utah Jazz, had long worked out with Giveback Homes’ first member, Nick Schneider, and heard about the agent’s multiple contributions toward building homes in Nicaragua. When Jefferson sold his San Diego home two years ago and recently moved to L.A. he used Schneider.